The protein carbonyl content (PCO) level in blood - these are markers for oxidative damage to proteins in the body. Glutathione (GSH) concentration in the liver - GSH is an antioxidant so don't know if a decreased level in the liver is a good thing or not! Cu-Zn superoxide dismutase (SOD) - again this is an anti oxidant so this decrease is unlikely to be beneficial. Catalase (CAT) activity in the kidney.This is a substance that turns hydrogen peroxide into water, thus it takes a free radical producing substance and neutralizing it. This decrease could be caused by lack of peroxide to neutralize. This work was done with rats as much as boron decreased some of the bodies anti oxidant protection. However overall as markers for oxidative stresses and DNA damage decreased overall the body would appear to be in more health. 1) We should grow our fruits and vegetables in soil that has a healthy level of boron. In most cases this will be achieved by addition of a trace element mix at regular interviews. 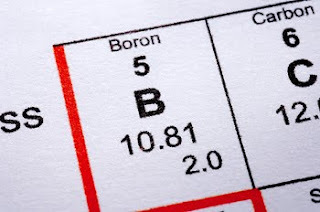 2) If you are unable to determine the boron levels in the soil (technically determination of bio availability boron it is one thing to have a trace element in the soil, its another to have it available for plants to use you need to make sure boron is in your multi tablet. Ince S, Kucukkurt I, Cigerci IH, Fatih Fidan A, Eryavuz A. The effects of dietary boric acid and borax supplementation on lipid peroxidation, antioxidant activity, and DNA damage in rats. J Trace Elem Med Biol. 2010 Jul;24(3):161-4. Epub 2010 Jan 31. Hyrsl P, Büyükgüzel E, Büyükgüzel K. The effects of boric acid-induced oxidative stress on antioxidant enzymes and survivorship in Galleria mellonella. Arch Insect Biochem Physiol. 2007 Sep;66(1):23-31.